Bass trombonist John Froelich lives outside of Minneapolis, Minnesota. He has been a member of the Lake Wobegon™ Brass Band since its founding in 1992 and can be heard on their CD Bravura. In addition to the brass band, John regularly performs with the Civic Orchestra of Minneapolis, the Riverside Brass Quintet, the Basilica (Minneapolis) Brass Quartet, and the Paramount Jazz Orchestra. He has been a member of the Minneapolis Trombone Choir and Minneapolis “Concentus Musicus,” where he played bass and tenor sackbut. His major teachers were Kenton Frohrip, Ronald Ricketts, and Henry Charles Smith. He completed a Ph.D. in music in 1987 at the University of Minnesota. The topic of his dissertation was the mouthpiece forces used by trombonists. John was president of the Minnesota Music Educators Association from 1995-97 and has served on the boards of various state and national organizations. 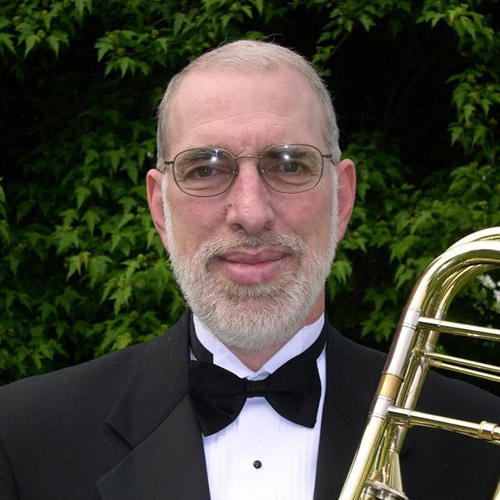 After teaching instrumental music in Minnesota’s public schools for over 30 years plus four years as an educational specialist for the Minnesota Department of Education, John took an early retirement in order to practice bass trombone and work on music education research. For the past several years he has conducted the “20 Piano Concert” for the Minnesota Music Teachers Association where over 700 piano students perform piano duets for an audience of over 4000. John exclusively performs on Edwards instruments and is a clinician for both Getzen and Edwards. He specializes in clinics and workshops covering brass performance practice for young students and music performance assessment.